About Mel L. Message Mel L.
We had a fabulous day with Mel who made recommendations from the start to make sure the tour was right for us. Beautiful hike through the gorge, just the right length. Mel was very knowledgable and informative about the area. Finished the day with a swim in beautiful clear waters on a local beach. Would highly recommend Mel and the tour. Our private tour made for one of the most memorable and worthwhile experiences ever. She combined breadth and depth of knowledge with charismatic, charming personality that made the tour dynamic and stimulating...an unforgettable day! TOUR GUIDE RESPONSE: Hi, it is extremely rare to be able to share what I mostly love about Crete with people who can appreciate from the smallest animals, flowers and details, to the wider complexity of their preservation. Thank you for trusting me with your tour, for being so ready to see and learn new things, and for sharing your beautiful thoughts and experience. I am sure we will meet again! A 5 out of 5 experience. The gorge walk was simply stunning with help from our friendly guide and awaiting driver at the end. The end of the walk was celebrated with a few drinks at the taverna near the end of the gorge. We did our walk early April and the weather was perfect! TOUR GUIDE RESPONSE: Great company, weather, distance, time of the year, and relaxing in the shade of the taverna at the gorge exit. We both really enjoyed meeting you. Thank you very much for a lovely day with the two of you! Mel was very pleasant and easy to communicate with. We had a great time! This was a fabulous tour. Hiking on Chania is just gorgeous and Mel was lovely and very helpful getting us back to the hotel y daughter was staying in, and also back to our ship. ( our daughter hd to stay ignorer to get back to university on time, whereas the rest of our family was getting back on a cruise). My only wish is we could have hiked for longer! I am no longer up to the grueling Samaria gorge trek (and it is not yet open anyway) so I opted for a guided tour of Palia Roumata gorge. A great experience. Guide was wonderful. Gorge was spectacular and all ours! Lots of flora to wonder about. Best time criss-crossing the rocky stream bed. Wet crossings made it all feel adventurous. Many thanks to Mel. This tour exceeded our expectations. Mel went out of her way to explain the many interesting things that make Crete a wonderful place to visit. 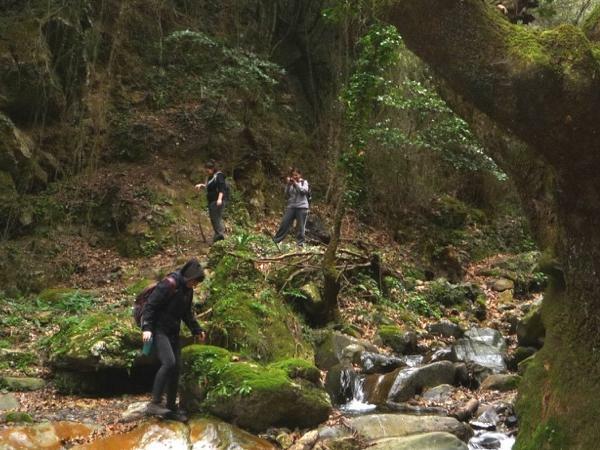 A wonderful hike in the Mesavlia Gorge and a beautiful lunch on the peninsula afterward. We could not have asked for a better tour guide. Mel was wonderful. Very knowledgeable, considerate and fun. She took my mom and I for a walk through the Mesavlia Gorge and stopped in a few local villages along the way to see things (like a 2000 year old olive tree) that we never would've known to look for if we were on our own. The walk was beautiful, and just challenging enough to feel like exercise ! Gentle walk through surprisingly lush countryside. Time to relax and observe the world. Mel was very pleasant and accommodating. We were really pleased with Mel and her guidance for our trip. We completed this day trip near the end of our walking holiday and were feeling a bit weary, but Mel controlled the pace to our needs stopping and resting more often as we needed. It was a memorable day of the St Irini River Gorge and her local knowledge immensely appreciated. A great day and a good way to have ended our walking holiday. Thank you Mel. My son (age 22) and I had a fantastic day hiking the Samaria Gorge with Mel. She arrived at 6:30 at our hotel in Chania to set out for the gorge, allowing us to get there before most of the tour bus groups arrived. Mel's expertise is in animal behavior, but she also has deep knowledge about the plant life in the region. Mel was equally happy trekking full speed down the gorge or stopping for a period to watch the wildlife (we we very lucky to see a pair of Kri Kri goats). Two thumbs up from us! We did the Agia Irini hike in september with Melita. She was very friendly and knowledgable to show us the vegetation we came across within the gorge. She was also very efficient to organise the tour at short term notice. The agia irini gorge is a worthwhile walk, with splendid scenery and less arduous and crowded than the Samaria gorge. Mel was a delight to be with, her love and knowledge of nature were very evident, we would recommend her to anyone going to Crete.